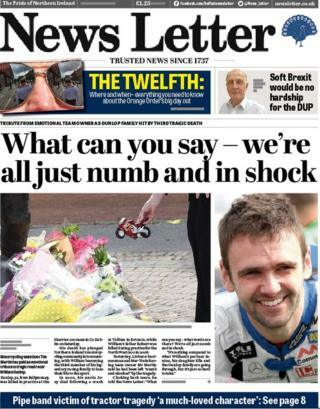 The front pages of Monday’s papers are filled with reaction to the death of William Dunlop who died at the Skerries 100 race meeting at the weekend. He crashed during a practice session on Saturday, becoming the third member of the Dunlop motorcycling dynasty to die taking part in the sport. The Belfast Telegraph dedicates nine pages to the tragedy. It reports that his grieving partner is pregnant with the couple’s second child. William Dunlop is the nephew of motorcycling legend Joey Dunlop who was killed in a crash in Estonia 18 years ago, and the son of Robert Dunlop, who died after a crash at the North West 200 a decade ago. The paper speaks to one of his cousins, Cathy Laverty, who says the family are in “a state of disbelief” that they have lost another loved one to the sport. 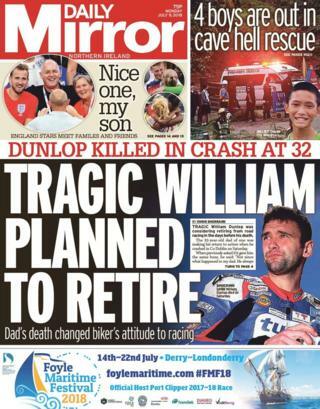 The Mirror claims that William Dunlop was considering his retirement from road racing in the days before his death. It said a crash at the North West 200, and concern over his partner’s pregnancy, had led to him pulling out of the Isle of Man TT last month. Tributes to the racer have been paid by sports stars including Rory McIlroy, Graeme McDowell and World Superbiker champion Jonathan Rea, according to the News Letter. The paper also reports that the prize fund for the Skerries 100 will be donated to help support Dunlop’s pregnant partner Janine Brolly and their two-year-old daughter, Ella. The Irish News also covers the Dunlop death but its lead is a disturbing account of one of Northern Ireland’s most notorious sectarian killings. Three young Catholic brothers, aged eight, nine and 10, were burned to death when their home was petrol-bombed at the height of the Drumcree dispute in July 1998. Twenty years on, the paper speaks to the boys’ uncle who gives a horrific account of having to identify the “blackened bodies” of his sisters’ sons – Richard, Mark and Jason Quinn. Frankie Quinn says the murders, which took place in Ballymoney’s Carnany estate, “more or less ripped our family apart”. Fast-forward two decades however, and there is a depressing continuation of sectarian petrol-bombing, with total disregard for human life. Three petrol bombs were thrown towards Londonderry’s Fountain estate on Saturday night, and 30 more were thrown when police arrived. “This is a small Protestant community whose very existence is an affront to a section of republicans who will not be content until all Protestants are removed from the west bank of the Foyle,” the city’s deputy mayor, Derek Hussey, tells the News Letter. Meanwhile, there are safety fears over several bonfire sites as loyalists prepare for Eleventh night bonfires later this week. The Irish News says one of the biggest pyres in Northern Ireland, in Bangor’s Kilcooney estate, is being rebuilt after it “dramatically collapsed” on Friday. The prominent loyalist Dee Stitt tweeted that the bonfire was pushed over on purpose due to “structural” concerns. The Belfast Telegraph speaks to residents in Newtownards who are furious over a bonfire site close to an electricity sub station. The paper says the pyre on Circular Road was removed due to “serious safety concerns” earlier this year, but a group of men began rebuilding it on Sunday morning. The resignation of Brexit Secretary David Davis came too late for many of the papers, but the Belfast Telegraph stayed up late to report the story. The Cabinet minister stepped down just 48 hours after the prime minister published her proposals for the UK’s future relationship with the EU, which contained compromises that angered Brexiteers. Fellow Cabinet colleagues Boris Johnson and Michael Gove appear to have reluctantly agreed to support Theresa May’s plan. The Irish News quotes the ever-polite Mr Gove saying that although the plan was not everything he hoped for, he was a “realist”. The more colourful Mr Johnson reportedly told a crunch meeting at Chequers that while he would back the plan, defending them will be like “polishing a turd”.